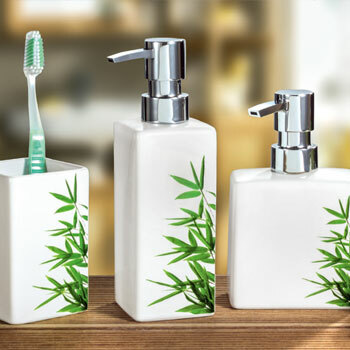 Add a contemporary look to your bathroom's decor with these bathroom accessories, which are printed with a beautiful bamboo pattern. Whether renovating a bathroom or simply making a change for the season, these bathroom accessory sets are sure to be a perfect fit. Made from 100% Stoneware, sturdy and durable.